We may say that through the transfiguring lens of victory or defeat we remember certain athletic movements as dramatic gestures. More so than a halo or aura, a gesture captures, in a specific, concise movement, a critical moment in a dramatic narrative. Gestures, with their freeze-frame effect, make the pathos associated with these dramatic moments more visible and more memorable. They are like material signifiers that appear to be permeated by specific meanings, and they thus become signifiers whose materiality exceeds the function of just carrying a meaning. Often we remember great athletes of the past and the present in this transfigured way. Roger Federer […] is such a case. We associate elegance and effortlessness with his flowing movements on the court that never seem to be centred on just one play. But the form and the rhythm of these movements, as an object of our perception and of our memory, tend to become independent of what we might read into them. They are unique, and they symbolize – by transfiguration – what we call ‘vintage Federer’. These ‘unique’ movements, that ‘become independent of what we might read into them’ deserve some expansion. Walter Benjamin famously commented, apropos Proust, that all great works of literature found a genre or dissolve one. We could adapt this dictum for our purposes by saying that all great sportsmen found a style or dissolve one. Implicit in the Benjamin comment is that these great works really always do both; no genre is dissolved without a new one taking its place; every great work of art is a work of enacted criticism, where our assumptions about genre — ‘the psychological novel’ or ‘the portrait’ or whatever — are shown to be narrow and misguided by A la recherche du temps perdu, by Braque’s The Portuguese. In the same manner, Roger Federer and Raphael Nadal, in their own ways, demonstrate at least the latter half of the dictum. Federer’s success outside of Wimbledon dissolves the genre of the power baseliner, Nadal’s extra-Roland Garros success the genre of the dogged-retriever style rewarded most on clay. 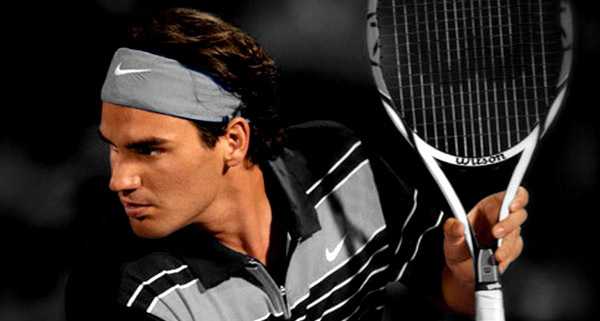 What separates Federer from Nadal is not, then, the dissolution of a style, but the foundation of style. Federer, like all great sportsmen, has created a style of one. When we say ‘Vintage Federer’, what we mean is that Federer is enacting himself. When he plays badly, people will say ‘he’s not himself today’. This can’t be said of Nadal, who dissolved the retriever style by demonstrating that, with enough furious energy, the style was capable of expanding across all surfaces. When Federer plays at his best, he only plays like himself. He is his style, as his style can only be described as ‘Federer’. This entry was posted in The Culture Count: Art, The Culture Count: Books, The Culture Count: Sport and tagged Aesthetics, Georges Braques, Hans Ulrich Gumbrecht, Marcel Proust, Raphael Nadal, Roger Federer, Tennis, Walter Benjamin. Bookmark the permalink.